We do not curently have theatre tickets available for Impossible. This could be because we have simply sold out or it could be that this show is no longer running. The information on this page remains purely for historical and informational purposes. 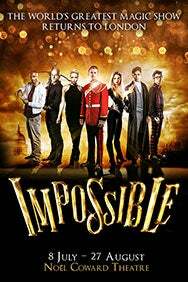 Impossible, the breath-taking magic spectacular thrilling audiences worldwide, is back by popular demand, returning to its home in the West End for a strictly limited season. Featuring the world’s greatest illusionists live on stage in a daring, jaw-dropping display of magical artistry Impossible will electrify and amaze theatre-goers of all ages. Guest starring the winner of Britain’s Got Talent 2016, Lance Corporal Richard Jones, the line-up also includes Explosive Street Magician Magical Bones, Daredevil and Escapologist Jonathan Goodwin, Cutting-edge Conjurer Sabine van Diemen, Grand Illusionist Josephine Lee, Boundary Breaking Magician Ben Hart, and Mind-blowing Mind-reader Chris Cox. Fusing death-defying stunts, technological trickery, grand stage illusions and close-up magic, Impossible reinvents the biggest and best illusions in history in the greatest magic show on earth. This family-friendly live entertainment has to be seen to be believed! Whatever you do, don’t try this at home!